I'm pleased to finally present the next Tea Pairing 101 installment. You may remember this is the series that fellow tea bloggers Jee, Georgia, and I have been working on. We take three variations of one type of tea, and pair them with a specific type of food. It's always a fun and delicious afternoon. This time we focused on black tea. 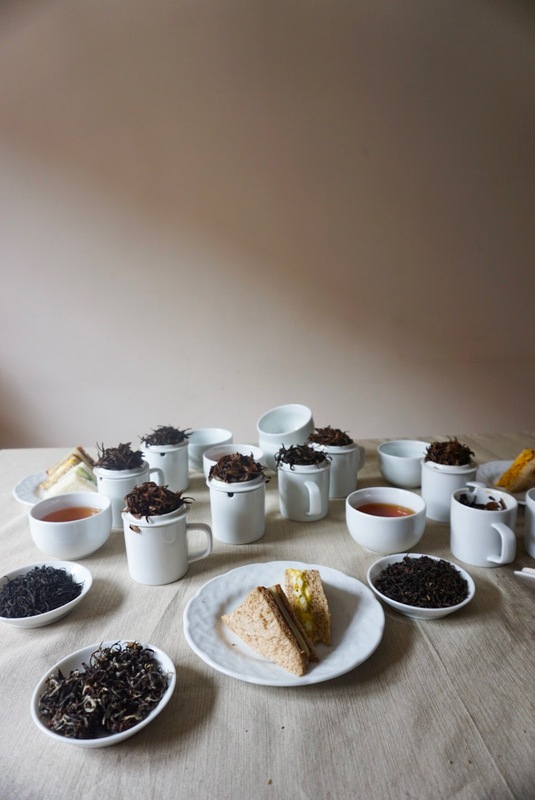 Black tea can be paired with a range of different things from savory to sweet. 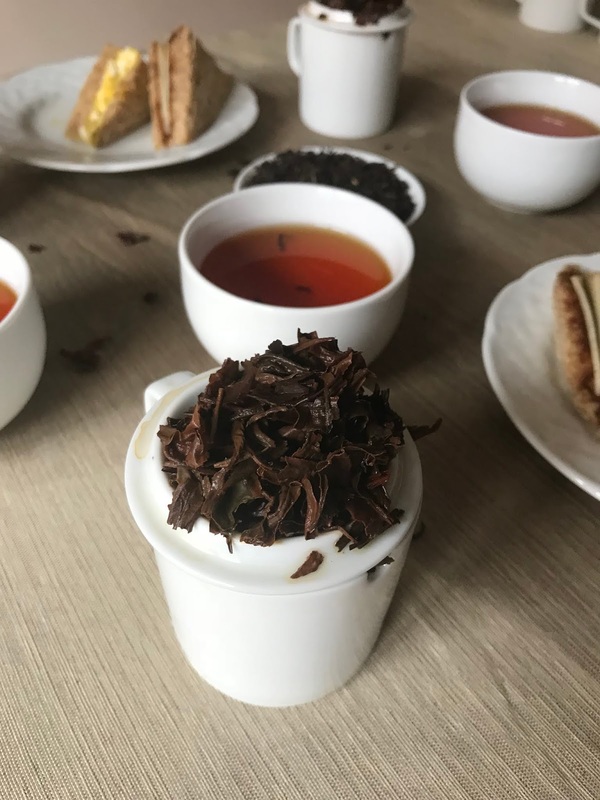 I almost always pick a black tea when I'm enjoying an afternoon tea spread (unless an oolong steals my heart), because it will usually pair well with a range of sweet and savory items. 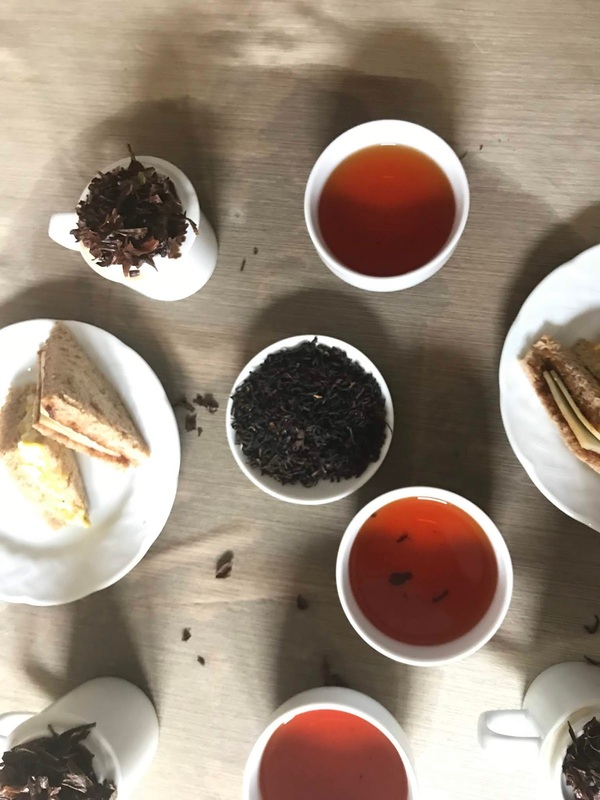 We decided to run with this idea and pair black teas with savory tea sandwiches, the type that you'd typically serve for afternoon tea. The location for this pairing was Jee's manhattan apartment. She takes amazing photos there all the time and has the perfect amount of natural light. It was fun to relax in a familiar location, and make as much mess as we liked without worrying about the consequences. In my photos you may notice the tablecloth is darker in some spots...yup, we got messy. 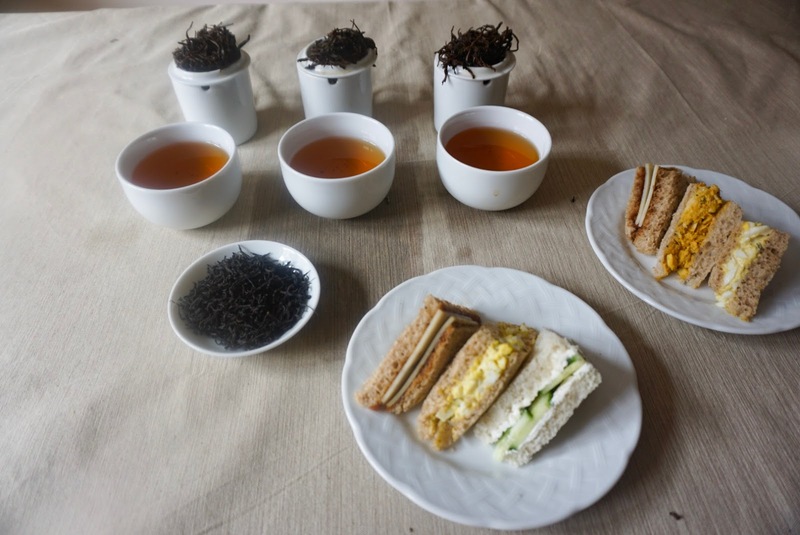 We decided to pick up a platter of tea sandwiches from Bosie Tea Parlor for this pairing. Jee and I had: curried chicken salad with golden raisins on multi-grain bread, farmer's egg salad with thyme on whole wheat, and cheddar cheese with branston pickle on whole wheat. Georgia is a vegetarian, so she subbed the chicken with a cucumber, cream cheese and dill on white bread. All of the sandwiches are classic choices found at an afternoon tea. They are also very easy to recreate at home. Turzum 2nd Flush Darjeeling from Harney and Sons (unavailable, this is a good alternative). The details are the same as in past pairings- 3 grams of tea, steeped in professional tasting cups for 3 minutes. We heat the water to the temperature suggested on the package. We do our own assessments of the dry leaf, infused leaf, and tea liquor. But to keep this post readable, I summarize all the findings. 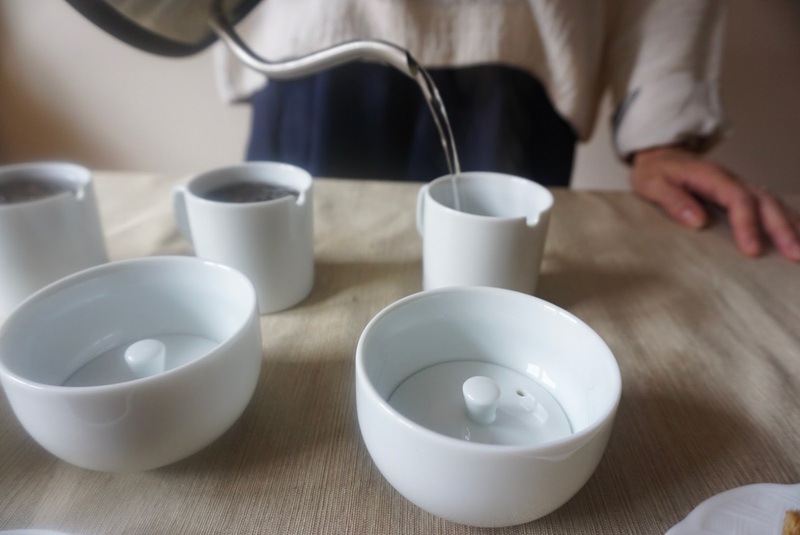 Our human sensory systems limit our ability to experience each of the countless chemicals in tea individually- rather we experience the tea as a whole. Further, we are even more limited in our ability to describe the experience. So don't be surprised or dismayed if you don't experience all the possible flavors in a tea. These inborn limitations should not inhibit your pleasure! 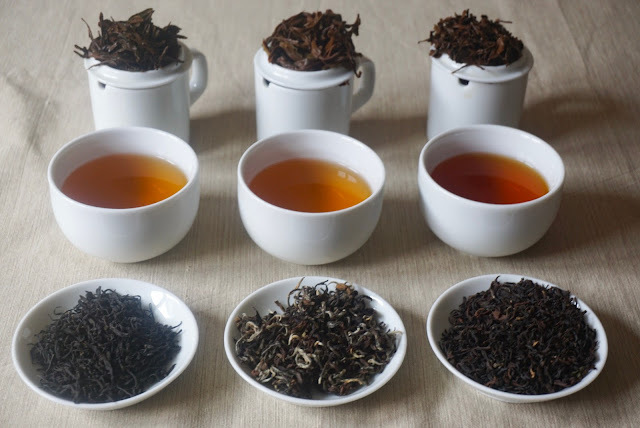 We decided to go with the lightest tea first, and that turned out to be the Lapsang, which was completely surprising! But this is no ordinary Lapsang Souchong. It is not the heavy, deeply smoky tea that you're thinking of. This tea is actually quite delicate, unlike most other Lapsangs I've tried (with one other exception that I will write about soon!). The leaves are long, thin, and twisted, quite elegant. The dry leaves bring bittersweet chocolate and dates to mind. Not a hint of smoke anywhere. We brewed the tea at 195°F: The amber brew is super smooth and sweet, reminding me of caramel, raisins, and juicy dark fruits. When sipped with a nibble of chicken salad, I'm not getting much of a feeling one way or the other. It's an 'okay' pairing, not fabulous, not awful. The egg salad seems a bit too mild and gets lost within the tea. To reference Ms. Lovelace's book again, she mentions that fatty foods can decrease astringency in black tea but can also mask flavors, so this makes sense. But the cheese sandwich- paired with the tea it creates symphony. The malty and sweet branston pickle works with the caramel and fruit notes in the tea. The chocolate flavor in the tea also stands up to the slightly tangy cheese. It's a lovely pairing, so easy to eat that I could have it every week and not get tired of it. This is a 2nd flush 2017 Nepalese black tea from the Jun Chiyabari estate. The beautiful soft leaves are a multicolor collection of brown, black, and silver. I love the fuzzy silver buds. The dry leaves smell sweet and fruity, like peaches and grapes. We prepared the tea at 200°F: The brew is light orange and smells extremely fruity. It has the misty muscatel flavor of a Darjeeling but with a thick body, and a touch of astringency. It also has a mouthfeel that we decided was 'fuzzy'. Very comforting. 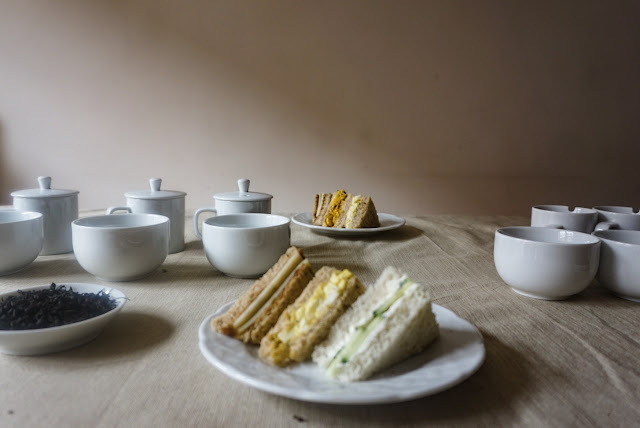 The cheese sandwich was not a good match here- the tang and vegetal flavors in the branston pickle clashed with the astringency in the tea- it's all I could taste. The curried chicken salad came in second place here- there are golden raisins in the salad that played nicely with the muscatel in the tea. The slight astringency in the tea worked well with the mildly spicy curry. In Ms. Lovelace's book (I need to keep referring to it, as it's super helpful! ), she mentions spices such as these work well with black tea- just think of a masala chai and you'll understand. A pleasant pairing but I did end up getting a bitter aftertaste, which wasn't pleasant. The winner ended up blowing me away with the dreamy perfection of the flavors- The smooth and creamy egg salad and the thyme worked really, really well, in fact it was enhanced with the tea. The fruity tea and the herbaceous, creamy egg salad were in perfect harmony, not muting the tea as I had expected. Another pairing I could eat on the regular. This 2nd flush Darjeeling from the Turzum estate is the strongest of the bunch. The leaves are in smaller pieces and have a chocolatey, fruity, and slightly floral scent. This tea brewed up a dark coppery color. We steeped the tea at 212° and were greeted with an aggressive, astringent flavor. It wasn't as nuanced as the other teas, but did have a hint of muscatel flavor. The bitterness in the tea didn't work well with the chicken salad sandwich. It masked much of the flavor, although the raisins brought out a bit of sweetness in the tea. The curry spices did tame the astringency a little bit, but not enough for me to truly enjoy the pairing. Unfortunately the strength of the tea completely erased the flavor of the egg salad (and it could also be the fatty mayonnaise working to mask the flavor as well), so I could barely taste what I was eating. The cheese sandwich was a better fit- the sweetness in the branston pickle helped tame the bitterness. I think the thick cheese also helped to tone down the astringency a bit. I think I will brew this tea again for less time, and see if that helps the astringency. Pairing sandwiches can be tricky because there can be many different flavors in one bite. Sticking with simple combinations and minimal ingredients such as egg and thyme (or perhaps dill or sage), cheese and sweet chutney, and a mildly spiced curry keep things simple enough to pair, but the variations in flavor keep it interesting. Tea sandwiches can be easy to get creative with, and can be customized in countless ways. To create your sandwiches you can even start just by pairing the tea with one ingredient (poached chicken, or just cucumbers for example), taste with your tea, and build your flavors from there. We all had a different experience with the pairing since we all come to the table with a different perspective. To read Georgia's vegetarian take on our tea pairing, visit her post here. To see what Jee had to say, check out her post here. 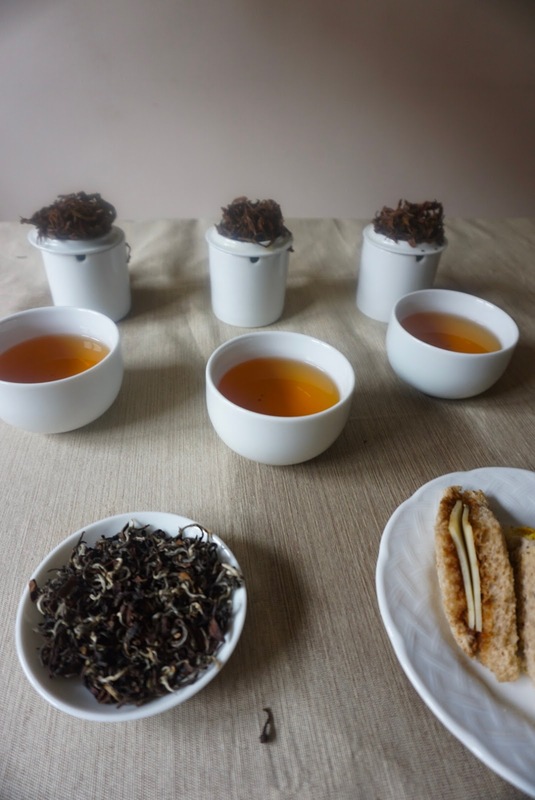 If you enjoyed this tea pairing post, have a look at our previous tea pairing adventures: Oolong and Fruit, Green Tea And Mochi, and White Tea And Cheese.